Coil compression springs manufactured under a custom design therefore fulfilling a specialty. Specialty compression springs are made according to the dimensions and loads that the customer requires to be met for their product or device. A spring design with a larger outer diameter than another design, even by one thousandths of an inch, is a completely different compression spring design. This applies to all other spring dimensions. Therefore, there is an infinity of options and rare will be the case when one single spring design will be able to be used for two or more products. This is what makes a coil spring a specialty compression spring. The customization of physical dimensions like outer diameter or total coils is needed for a compression spring to be able to undergo the loads and travel required for a device to function accordingly. Some devices may need the spring to achieve two working loads which don’t fall into a spring constant. This means that the spring will either need different outer diameters on the coils of its body or variable pitch in between the coils. You might be able to find similar springs in stock through The Spring Store. The spring store is an online store which sells several types of springs and offers thousands of different spring designs. If you have some tolerances around the spring’s dimensions and need a small quantity, stock springs from The Spring Store are the best option. 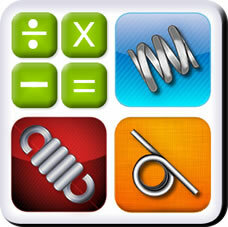 Design your specialty compression springs using our free compression spring calculator, Spring Creator. Spring creator will calculate your compression spring’s strength and elasticity with only a few of your spring’s physical dimensions. The calculations of spring rate, spring force, and spring travel are 99.99% accurate. Now you are able to calculate your specialty compression spring design on the go by downloading our spring creator app on your Android or iOS device. It is compatible with both smart phones and tablets. Since The Spring Store is also linked to the calculator and you are given suggestions for similar stock compression springs, not only are you able to calculate your specialty compression spring design on the go but you are also able to purchase your stock springs while mobile.